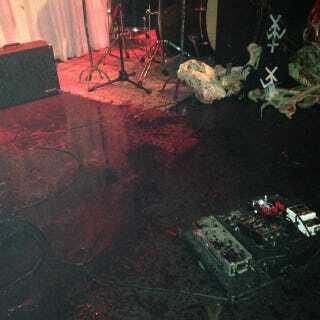 After what we can only describe as a terrible show featuring terrible bands with terrible venue etiquette, Asheville, NC favorite Lexington Avenue Brewery was less than amused when they found their venue covered in pigs' blood. The show was put on by local tattoo parlor Empire Tattoo. "they have kids, groceries and bills, and now they are out of work for several days... I will do everything that I can to compensate them." Sounds like a good guy. He would not discuss legal action against Empire Tattoo or the bands, nor could he give a definitive reopening as the brewery is very popular in the area as a music venue, but also as a brewery, bar and restaurant. Good luck and a speedy reopening to the ownership and staff of the LAB. To the lineup of the Empire Tattoo show, there's a fine line between being metal and being a flock of douchebags. Good luck salvaging your equipment, douchebags.